Mission Creativity: Happy May 1st! 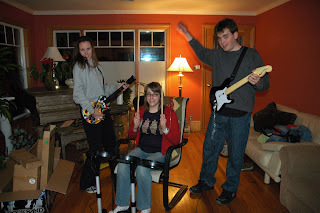 Played Rock Band with Jenna, Lisa, and Dan last night. We had way too much fun considering it was Wednesday. I seriously thought it was Friday. Found out that Lisa can carry a tune! We had some yummy Hawaiian pizza (my favorite) from Luigi's while we had a jam session. I even found a little time to play a round of Bingo over at EBB Creations. I was so close to winning. Maybe next time. In other happy news, my Dozens kit arrived yesterday! I was able to snag one after all. That's just how I roll ;). I am super excited and can't wait to play with Michelle's adorable creations. I was taking Archery, Geography, History of California, American Sign Language, some ilk of Math, Biology and probably Art & Composition at Skyline College. I was getting excited about the semester coming to an end and going to Kauai for two weeks with the Childers. I like your survey! 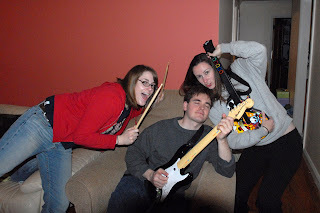 :) Love the rock band pics too, when we first got it we played allll the time, hehe. Yay for rock band! Love those pics! You know we have had Rock Band since Christmas in our house, and I'm the only one who hasn't played it yet. Looks like you all had such a ball playing! I feel like such a reject, I'm gonna cry cause I wasn't invited to guitar hero night! Uh, I mean Rock Band! Rock band is awesome. Is anyone good at the drums? that's our worst instrument. I prefer bass. One day we will get to play together! !